Fruits will always be delicious and yummy to eat. But have you thought of making fruits as your center piece while making your guests eat them at the end of the day? Unlike flowers, where at the end of the day you are going to throw them out after the party with fruits, your guests can eat them the edible fruit center piece. Therefore, there will be no waste of money instead the fruit arrangement does serve two purposes as center piece and as food as well. The first thing you must do before you even attempt on creating an edible fruit arrangement is to check the number of people who will be eating the fruits. When you already got the number, you can surely determine the size of the edible fruit basket that you will be making. Choose your fruits properly. It is highly recommended to purchase fruits that are in the season. At least, fruits that are in season do come in an affordable price compared to fruits that are not in season, mostly they are a bit expensive. Do not even attempt to buy fruits whose skin will grow brown in few hours or so. These fruits will destroy the whole presentation. Get a more colorful and vibrant edible fruit arrangement buying melons, grapes, berries, strawberries, kiwis, and the like. The next step will be arranging the fruits into the basket. In order to do so, you must have a floral foam (green), be sure to cut the foam that will fit perfectly inside the basket. Position the foam in such a way that the foam will be leveled out right at the edges of your fruit basket. Then, get something that will camouflage with the floral foam. You do not want your guests to see that foam, right? It would be highly recommended to use lettuce. Put the lettuce on top of the foam to cover it up. To make it more beautiful, you can have some lettuce leaves hang even at the edges. Get yourself a handful of bamboo skewers. 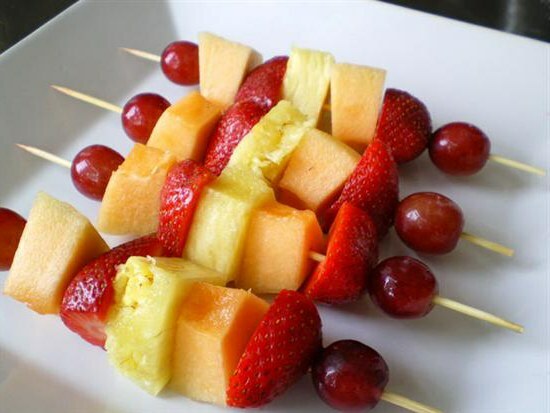 Stick the fruits into the skewers and stick the fruits towards the foam. This is where your creativity sets in. Make sure that you arrange the fruits in such a way that it would be more appealing.